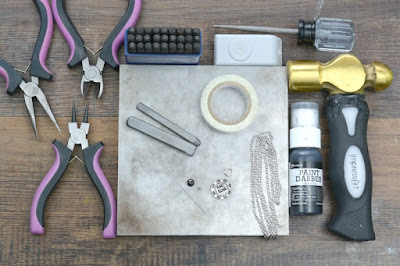 Today Adrianne Surian creates a fun necklace using metal design stamps and a few tools. See her step by step necklace tutorial below. As you can see, I’ve been playing around with some patterns and design! This was a fun piece to make – a little bit sweet, a little bit sassy, perfect for Halloween but not over-the-top… For today’s piece I’m using a basic economy font and two Beaducation design stamps that they sent me to test out. I’ll leave links below to many of the supplies I used in case you’d like to check them out for yourself or to do some shopping! So, let’s dig into the design stamps. I think we can all agree that the best part about metal stamping is making beautifully personalized pieces. 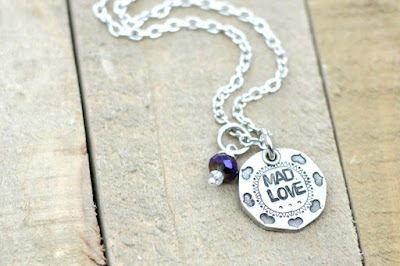 But now that stamping has been hot for a few years, new trends are emerging with artisan blanks and new designs. It’s increasingly popular to stamp designs on basic blanks, but I know that can be challenging for new stampers! I’ve simplified today’s project with a quick design hack using stamping tape and a 3/8″ circle paper punch. New stampers can benefit a LOT from using stamping tape – it helps you align your letters vertically. You simply drag the stamp very gently downward to the edge of the tape, and when the bottom of the letter hits the tape, you’ll feel it stop. 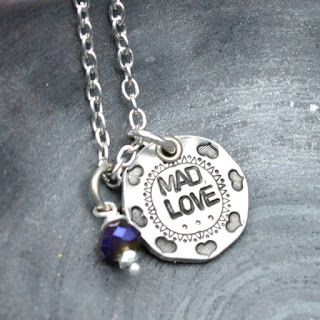 After stamping my circle, I added tiny fat hearts around the perimeter of the blank and stamped “MAD LOVE” in the center with 3/32″ economy stamps. I love the sentiment for year-round wear, but the “madness” aspect makes it an especially fun Halloween piece, too! I prefer to use enamels and acrylic paint over Sharpie markers to darken my impressions, but it’s simply a matter of personal preference – all methods work well! 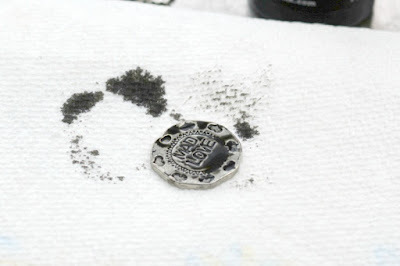 If you use the sharpie to darken your piece, you’ll need to polish away the excess ink. 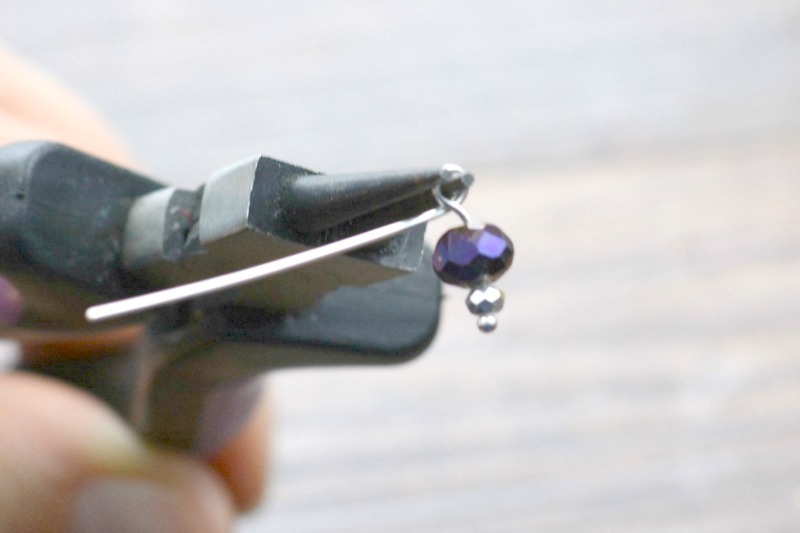 With enamels or acrylic, the excess can simply be wiped away with a paper towel. You can see above that my message was slightly high on the center of the blank. This happens! I’m using tools that are new or lesser-used in my collection, and each stamp or font you work with will have its own best uses. 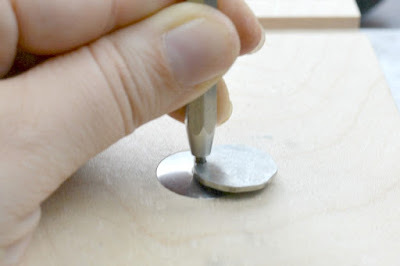 But I’ll let you in on a little secret that I use to fill gaps and centering issues: A few well-placed dots with an awl look decorative and they help to balance the piece. You’ll see below exactly what I mean! Now, my favorite metal to stamp on is pewter. It’s heavy and substantial, and it’s also soft and takes a great impression. 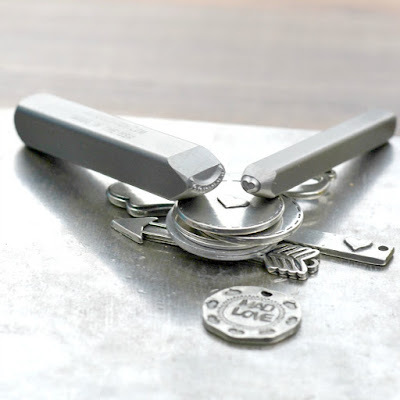 Pewter is used in some beautiful artisan blanks because it can handle the additional detail that basic metals like aluminum cannot. But BECAUSE it’s so soft, you may notice that the face of your stamps can actually cause misshapen blanks. The hearts I added along the edges cause my circle to look slight octagonal, and the shift of the metal cause my hole to become a little squashed. This is not a bad thing, and it’s not a flaw! 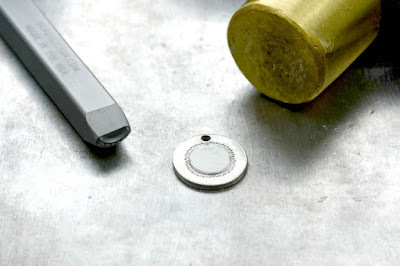 It’s a natural effect of displacing metal with stamps. But the perfectionist in me wanted that top hole to be round, so I set an eyelet in the hole using an eyelet setting tool. This step is completely optional! It’s simply something I like to do to make a hole look a little more finished. Now that the star of my piece was ready to go, I still wanted to add a little sparkle. I threaded a 3mm and 6mm bead onto a jewelry head pin, wrapped the pin around my round nose pliers, and wrapped the wire end in coils between the loop I created and the top of the beads. This is a basic wire wrapped charm and I use the technique in many (maybe most!) of my favorite designs. Finally, I added jump rings to both the stamped pendant and the beaded charm, and strung them on a 26″ necklace chain, which is my favorite length at the moment. It hits near the bottom of the rib cage for most women, but of course it will depend on your stature and on your personal preferences! You can make this necklace as long or as short as you like.